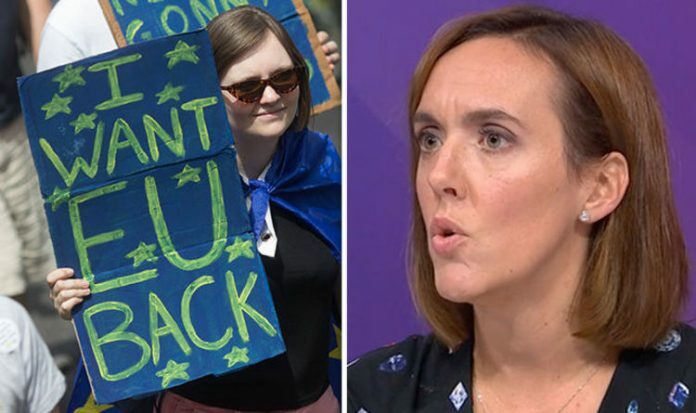 Ms Tominey was sitting on the Question Time panel when she made the remarks, stating leave voters knew exactly what they were voting for and wanted to “completely sever ties” with the EU. The top newspaper editor referred to a recent poll from one of the UK’s leading pollsters Sir John Curtis, which stated there was “absolutely no evidence of a swing in favour of a second referendum”. Referring to an audience member who suggested the public did not know what they voted for in 2016, Ms Tominey said: “I don’t know of any leave voters who – despite everything that has been said and project fear – are running around screaming going, ‘oh my God, oh my God, I have made a terrible mistake’. Ms Tominey pointed out the country had always been split politically and therefore the Brexit debate was nothing new. She said: “The country is split down right or left lines. Ms Tominey was joined by Liberal Democrat Leader, Vince Cable, who has said he will resign as leader as soon as Brexit is either “resolved or stopped”. Vice-Chair of the Conservative Party, Chris Skidmore, who joined Ms Tominey, on Thursday night, argued earlier in the programme that we must respect the will of the people and deliver Brexit. Mr Skidmore’s comments were met by enthusiastic applause from the TV audience. The top Tory also revealed he was part of a pro-Leave group called “The Brexit Delivery Group”. He said: “I believe we should have a pragmatic solution and having a common rulebook allows for that. “We are going to have standardisation anyway when it comes to certain goods. “We want to sell into Europe – so we might as well get to the point of leaving to start with.